Caiques are small stocky parrots who originate from the Amazon basin in South America. 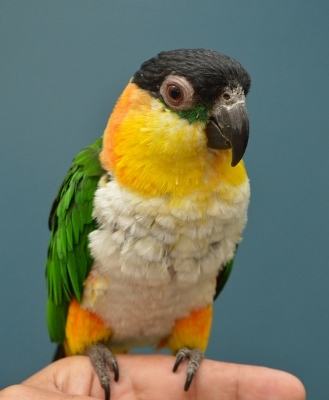 There are two species of caiques – the black-headed caique and the white-bellied caique. In the wild, the black-headed caique (Pionites melanocephala) is found north of the Amazon River in Peru, Ecuador, Brazil, Colombia, Venezuela, Guyana, French Guiana, Guyana and Suriname. The white-bellied caique (Pionites leucogaster) is found in the wild south of the Amazon River in Brazil, Peru and Bolivia. So just how do you pronounce caique anyway? Well, it’s doesn’t sound like “cake.” Caique is pronounced ky-EEK. Of all the parrots species, caiques are one of the smaller ones. They have stocky bodies and small square tails. Adult black-headed caiques are typically around 23 – 25 centimetres (9 inches) in length and weigh, on average, between 150 and 170 grams (5.2 – 5.9 ounces). At about 25.5 centimetres (10 inches), adult white-bellied caiques are a bit bigger than their black-headed counterparts. They are also a bit heavier too, weighing about 10-15 grams more. One particularly distinctive physical feature that sets caiques apart from every other parrot is the the white feathers on their chests and bellies. As their name suggests, black-headed caiques have black heads and black beaks with a hint of green feathers under their eyes. Black-headed caiques have yellow feathers on the front of their necks with more orange tones on the nape. They also have orange feathers on their thighs while their backs, wings and tails are green. The underside of their tails are yellow. Like their black-headed counterparts, white-bellied caiques also have green feathers on their backs, wings and tails with yellow feathers underneath their tails. But their heads are orange and they have pale beaks. They have yellow feathers on their thighs. Caiques in the wild will “surf” on wet leaves. It’s believed they do this as a way of bathing or cleaning themselves. In the wild caiques will live in the upper canopy of the humid Amazon rainforest. Caiques aren’t known for flying long distances and are quite adept at moving around by climbing, jumping or simply walking. Some scientists believe the caiques’ lack of will or ability to fly long distances is the reason there is such a distinct range between the two species, with the black-headed caiques living north of the Amazon River with the white-bellied caiques on the south. Caiques are very energetic, social and playful birds and are known as being the clowns of the bird world. In captivity, they can bond well with people. But they need a lot of attention and room to play. When caiques play they will “wrestle” with their toys by rolling around and playing with their toys while on their backs, which is unusual behaviour for birds generally speaking. Caiques have a long lifespan and, with proper care, can live on average for about 30 years in captivity.